What Is OCD and How is it Recognized? Virtually everyone has experienced worries, doubts or fears at one time or another. It’s natural to worry about life issues such as your health or the well-being of someone you love, paying bills or what the future will bring. Everyone has also an occasional intrusive thought; it’s not even abnormal if you’ve had an intrusive “bad” thought. That’s not OCD. OCD is characterized by obsessive thoughts, impulses, or images and compulsions (overt or mental rituals) that are difficult to suppress and take a considerable amount of time and energy away from living your life, enjoying your family and friends or even doing your job or school work. When OCD symptoms are present, it’s important to consult a mental health professional who is knowledgeable about OCD for evaluation and treatment. Doctors and researchers are divided on what causes OCD but many believe OCD is the result of abnormal brain circuitry function. It tends to be genetic and symptoms often begin during childhood. However, research continues. A recent study showed that inflammation of the brain tissue was 32 per cent higher in the brains of OCD sufferers compared to others. Some examples of obsessive thoughts are fear of being hurt, or germs, or contracting a disease. Compulsions can include repetitive tasks, frequent hand washing, frequent or repetitive cleaning, checking on things. The average age of onset is 19 years old. Sometimes the condition manifests itself temporarily and in some cases it is prevalent for a lifetime. 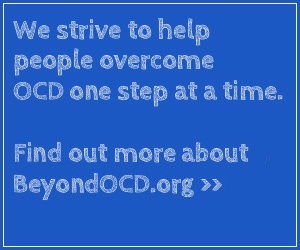 OCD can be extremely burdensome to the sufferer, often impacting the day-to-day life of not only the person with OCD but their families as well. In some cases, compulsions are shaped by the nature of the obsessions. Compulsive washing, for example, is commonly performed in response to obsessive fears of contamination. Similarly, a fear of the house burning down may lead to the excessive checking of the stove, oven, and iron. In other cases, obsessions and compulsions are paired in a way that defies explanation; the compulsive behavior is completely unrelated to the obsession. For example, a businessman may feel compelled to tap his desk multiple times to prevent harm from coming to his family while he is at work. It’s important to note that some people with OCD perform rituals not in response to a distinct obsession or fear but rather in response to certain sensory phenomena. Visual, auditory or tactile sensations may trigger a need for something to look, sound, or feel “just right.” Upon seeing a tile floor, for example, a person may experience a need to trace over each of the tiles mentally in a symmetrical fashion. In other cases, external triggers are absent, but the individual has an inner feeling and/or perception of discomfort that causes him or her to repeat a behavior until the feeling is relieved; the behavior needs to be repeated until it feels “just right” or “complete.” In still other situations, repeating behavior is preceded neither by obsessions nor sensations but rather by a need or urge. Below are some examples of the more common OCD symptoms. Obsessions are shown in italics, and rituals that are frequently associated with those obsessions are listed beneath them. Avoiding touching “dirty” surfaces that others may have touched, including common-area objects such as doorknobs, desks, shared supplies, computer keyboards, soap, cafeteria trays, etc. Note: Individuals with OCD who have violent/aggressive thoughts neither have a history of violence nor act upon these urges or ideas. Reading a paragraph over and over again to prevent harm from coming to a loved one, pet, etc. Note: This form of hoarding is related to the obsessions and compulsions of OCD and is distinct from Hoarding Disorder (see Related Conditions). Symptoms of OCD vary widely, depending upon the individual and the situation. Adults and children experience many symptoms other than those mentioned above. Interestingly, the majority of people with OCD are able to function reasonably well, and friends or co-workers may not even suspect there’s a problem. But when symptoms escalate to the point that they interfere with functioning – excessive time is lost from work, an individual is unable to work, a student who normally receives good grades in school suddenly receives poor grades, uncontrollable fear and anxiety are severely straining a relationship – it’s time to get help. How Effective are OCD Medications? Medications are ineffective for nearly one in three people with OCD. Nonetheless, conventional therapies include anti-anxiety and antidepressant medications along with behavioral therapies and psychotherapy. Antipsychotic medications are becoming a more accepted treatment method. The good news is clinicians are becoming increasingly able to offer personalized treatment regimens. Medications and therapy are the short-term treatment protocol for OCD and where these are effective they become the long-term management solution. OCD is never cured, only managed. Everyone from family members to friends expects a new mother to be joyful. But society doesn’t realize that PPOCD can leave a new mother feeling devastated and exhausted. Untreated PPOCD can have a negative impact a mother’s ability to care for her child and severely strain her marriage, friendships, and other relationships. Effective individualized treatment for both post-partum depression and PPOCD (which frequently occur together) is available and can enable a new mom to manage her symptoms. As with other types of OCD, postpartum OCD usually responds to medications (serotonin reuptake inhibitors) and cognitive-behavioral therapy (CBT). Although serotonin reuptake inhibitors are effective treatments for OCD, their risks to the unborn and breast-feeding child are not yet well known. Many experts believe these medications probably pose no danger, but it’s important to discuss the possible risks with your doctor on an individual basis. A safer, yet more challenging treatment approach, is CBT, which has been demonstrated to be more effective than medications for non-postpartum OCD.